I have to be completely honest with you…I haven’t always been the biggest fan of the Floral Crown trend. But, they are definitely growing on me (thanks to Audrey of French Knot Studios, and this inspiration! )… and for the right Wedding, and the right Bride, or Flower Girl, they can add the perfect extra touch. Ideal for Vintage and Romantic Weddings, Floral Crowns can work with any hairstyle and can be customized to fit your color palette. The key is to use hardy flowers, such as Roses or Spray Roses, Daisies, Mums, and Dahlias. Delicate flowers such as Ranunculus, Anemones, and Sweet Peas won’t hold up as well, since they will be without water all day and on top of a warm surface, your head! So, are you ready to check out the steps for this easy DIY project?! First, take a sneak peak, then head on over to Ruffled for the full DIY! Special Thanks to Audrey, the talented event and wedding planner that designed and created these Gorgeous and Totally Fun Floral Crowns! 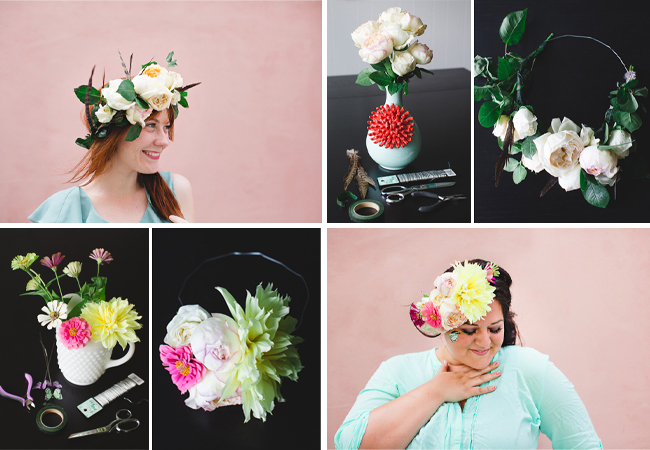 Now, head to Ruffled to see how you can create these beautiful Floral Crowns too! Featured Testimonial and Bouquet Breakdown – Halloween Elegance!